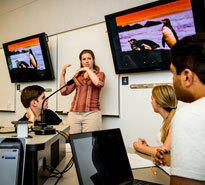 The course (Biol 2001), which launched in 2007, guides students through an exploration of the breadth of career opportunities within the biological sciences. Originally, the course was for transfer students exclusively. Several years ago, it was extended to students in the award-winning CBS Dean's Scholars program. 71% of the transfer students who took the course in 2007 graduated by spring 2011 compared with 51% of those who did not take the course. From the start, students enrolled in the course have taken StrengthsQuest. This fall, the U of M began requiring all incoming freshmen to take the strengths evaluation instrument. The course is based on the Explore-Prepare-Succeed model in which students investigate their options, reflect on their own goals and strengths, and create an action plan. Phase one of the plan to rebuild Itasca Biological Station and Laboratories is once again on the University’s capital request to the Minnesota Legislature. The U of M is asking for $6.09 million to build a new campus center that replaces three buildings and will provide 10,800 square feet of technology-enabled laboratories, classrooms and offices. CBS asks for your help to persuade the governor and legislature to allocate funds to replace deteriorated and obsolete facilities with the new center. Governor Dayton will be planning his budget over the next few weeks. Please write to him now. For details, go to the Rebuild Itasca website, where you will find key messages you can use to compose a letter as well as the governor’s address. Funding for Itasca is one of six projects in the U’s 2012 capital request. Kate VandenBosch, head of the Department of Plant Biology and a member of the faculty for more than a decade, has been named dean of the College of Agriculture and Life Sciences at the University of Wisconsin-Madison. Her appointment begins March 1. As head of plant biology, VandenBosch transformed the department into a national leader by recruiting a team of talented young faculty with expertise in plant genomics and evolution. She has also been active in university governance as a member and chair of the Faculty and Senate Consultative Committee and served as interim dean of the College of Food, Agricultural and Natural Resource Sciences in 2006. Allan Kerandi (Biology), Nora Ali (Biochemistry) and Suresh Pavuluri (Biochemistry) received Scholarly Excellence in Equity and Diversity (SEED) Awards November 16 at the Office of Equity and Diversity’s annual breakfast. 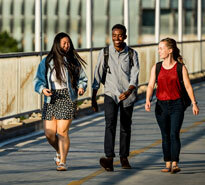 The awards recognize students who demonstrate engagement with and commitment to issues of equity and diversity through outstanding academic achievement and activism. Kerandi serves in a leadership role with the African Student Association and Student Today Leaders Forever. He also works with underrepresented students through tutoring and peer mentoring for the Multicultural Center for Academic Excellence. Ali is president of Circle of Giving, a student group launched by CBS undergraduates to address health disparities in underserved communities. Pavuluri is working to address variations in standards for students volunteering in medical settings in developing countries. CBS Dean's Scholars has won the National Association for Student Personnel Administrator's Regional Award for Innovative Program. This follows their recent award from the Minnesota College Personnel Association’s Innovation in Student Development Award. Nikki Letawsky Shultz is director of CBS Student Services. Meaghan Stein is coordinator of CBS Dean’s Scholars. The University Imaging Centers, which includes facilities for advanced optical imaging and basic electron microscopy on the St. Paul and East Bank campuses, welcomed more than 100 visitors to its new location at 1-151 Jackson Hall earlier this month during a two-day open house. “I think that the new space, staff, instruments and services will have a major impact on research efforts here at the University of Minnesota for years to come,” says Director Mark Sanders. Going forward the cutting-edge facility, which provides researchers with access to more than two dozen advanced imaging systems, will increase capacity in the areas of live-cell/live-animal imaging and super resolution microscopy. The results are in and the college’s rate of participation in the U of M’s annual giving campaign increased to 19.87 percent up from 18.83 percent last year. CBS faculty and staff pledged a total of $26,672 to a variety of causes. Kudos to Cindy Lawson (CBS Dean’s Office) who led this year’s effort. Global food demand could double by 2050, according to a new projection by David Tilman, Regents Professor of Ecology, and colleagues, including Jason Hill (CFANS). Producing that amount of food could significantly increase levels of carbon dioxide and nitrogen in the environment and cause the extinction of numerous species. But this can be avoided, their paper shows, if the high-yielding technologies of rich nations are adapted to work in poor nations, and if all nations use nitrogen fertilizers more efficiently. Nevin Young (Plant Pathology/PBIO) headed an international team that sequenced the genome of the legume Medicago truncatula and in the process learned that the genes controlling the plant’s symbiotic relationships with fungi and bacteria can be traced back nearly 60 million years. The project’s goal, Young says, was to document how symbiosis – the process that legumes like Medicago use to create their own nitrogen fertilizer through association with special bacteria – evolved. Scientists use Medicago truncatula to understand the biology of legumes such as soybeans, alfalfa and peas. How should society pay for ecosystem services? Over the past 50 years, the services ecosystems provide (such as clean air and water, fertile soil and animal habitats) have declined substantially as a direct result of converting land to produce foods, fuels and fibers. Seven of the world's leading environmental scientists, including David Tilman (EEB) and Stephen Polasky (EEB/Applied Economics), both members of the National Academy of Sciences, met to discuss strategies to pay for these services to sustain them. Mechanisms used to subsidize farming, forestry and aquaculture provide models, but also reveal pitfalls. “We need new market mechanisms that reward farmers for the quality of the water that leaves their lands, and for other important ecosystem services,” says Tilman. The Nutrient Network (NutNet), a global consortium of grassland research sites founded by Elizabeth Borer and Eric Seabloom (EEB), was recently featured in Science. The article describes how the network uses a few simple experiments on small plots at 68 sites in 12 countries to study the relative impacts of herbivores and nutrients on community structure. A paper published by a NutNet member in Science last month showed that a longstanding theory about the relationship between plant productivity and species richness in fact rarely occurs. One member described the network, funded only by an NSF grant for $322,000, as “big science on a shoestring.” Per the article, the network is poised to make substantial contributions to ecology. To Borer, the success shows that individual scientists at any stage of their career can help answer big questions even without landing a major grant. “We're out to change the culture,” she says. Three CBS students presented talks earlier this month at the first TEDxUMN event. Judd Hultquist (“We can win the arms race with HIV”) is a graduate student in Reuben Harris’ lab pursuing his Ph.D. in molecular biology. Suresh Pavuluri (“Let’s change the focus of international healthcare missions from short-term fixes to long-term solutions”) is an undergraduate studying biochemistry. George Chao (“Computer theory and genetics: How a new perspective sees them hand-in-hand”) is an undergraduate studying genetics and computer science. Robin Wright, associate dean for faculty and academic affairs, presented a science education colloquium (“Why Content Isn’t Enough: Engaging Undergraduates as Emerging Colleagues”) and a teaching workshop (“Start Where You Are: Incorporating Scientific Teaching Principles Into Your Existing Lectures”) for biology faculty at Yale University in October. She also spoke about biology education at the University of Cincinnati earlier this month and the University of Florida and George Washington University earlier this semester. Kelaine Haas Zimmerman will join CBS Student Services as undergraduate research coordinator. She is currently completing her Ph.D. in genetics, cell biology and development at the University of Minnesota. Haas Zimmerman received her B.S. in biology with a minor in chemistry from Wake Forest University. She has experience with active learning classrooms and mentoring undergraduates. As undergraduate research coordinator, Haas Zimmerman will work to increase student involvement in undergraduate research through mentoring, developing workshops and resources for students, and serving as a point of contact for both students and faculty. Kathryn Hanna (Biology Program) gave a presentation on “Best Practices for Internships” at the Midwest Cooperative Education and Internship Association (MCEIA) annual conference in Milwaukee in late October. She was also appointed to the MCEIA Leadership Council and serves as the Minnesota state director for the organization. This session will feature an overview of intellectual property and procedures for cost-effectively securing intellectual property assets within science and technology-related businesses. Attorneys with extensive experience in securing and managing intellectual property in a broad range of industries will lead the discussion. 2-206 Carlson School | West Bank | 4 p.m. Attend a special lecture and book-signing event with CBS alumnus Darby Nelson. In his new book, For Love of Lakes, Nelson weaves together history, science and poetry in an affectionate account documenting our species’ long relationship with lakes and addresses the shortfall in stewardship over America’s 130,000 lakes. St. Paul Student Center | 7 p.m.
Share your passion for science at the Minnesota Academy of Science’s Science Bowl for Middle and High School Students. Join other science professionals in providing an opportunity for over 250 students to apply their science and math knowledge in a competitive format similar to the game show Jeopardy. Volunteers are needed to serve as moderators, scorekeepers, timekeepers, scientific judges and many other roles. Sign up to volunteer at the January 20 event for high school students or the February 11 event for middle school students. Coming up in November and December, the UMN Libraries will offer workshops on Better Data Searching, Copyright, Formatting Your Dissertation or Thesis in Word 2007, Grant Funding Search Tools and Resources and RefWorks Basics. For a complete schedule of workshops, visit the University Libraries website. There’s still time to respond to the survey sent by the St. Paul Campus Gay, Lesbian, Bisexual, Transgender (GLBT) and Ally Advisory Group to members of the St. Paul campus community in late October (subject line: “How Is the St. Paul Campus Treating You?”). The group will use the results to help enhance and improve campus climate for GLBT students, faculty and staff. The University Retirees Association is offering development grants for University retirees. Grants of up to $4,000 are open to faculty and P&A retirees who wish to continue their research or other professional work. The deadline for applications is December 9.